I awoke at an ungodly predawn hour to the muted patter of rain outside our window. Fearing the worst, I dragged myself to the window to see if my imagination was playing tricks on me. Raindrops dripped onto our balcony railing and blurred the Danube in the city’s predawn light. Oh, no, I groaned. I fled back to my warm cocoon of covers with visions of an ocean of Viking’s bright red umbrellas dancing in my head. By the time we arrived for breakfast the rain had turned to a light mist and Viking’s busses were already waiting outside. Bins of those bright red umbrellas stood sentry as everyone walked out to meet the tour guides. Our full day in Budapest began at 8:30 with a bus ride through the drizzle to the Castle District, the oldest part of Buda. 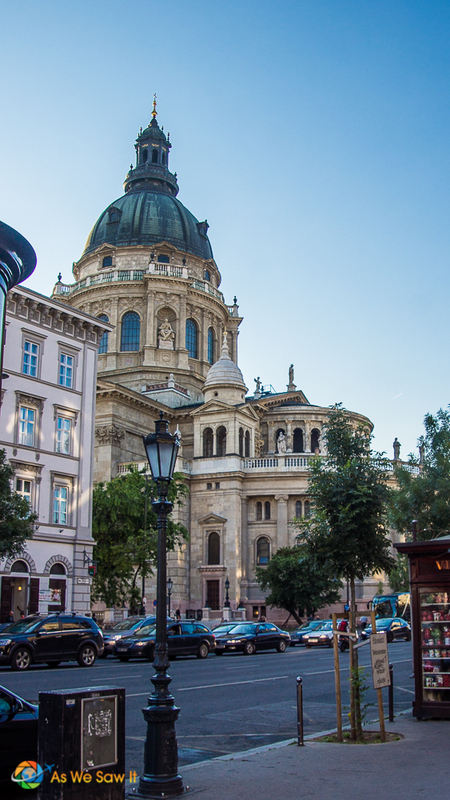 Budapest—including the Banks of the Danube, the Buda Castle Quarter and Andrássy Avenue—has earned UNESCO World Heritage Site status, and today's tour was designed to include these areas. 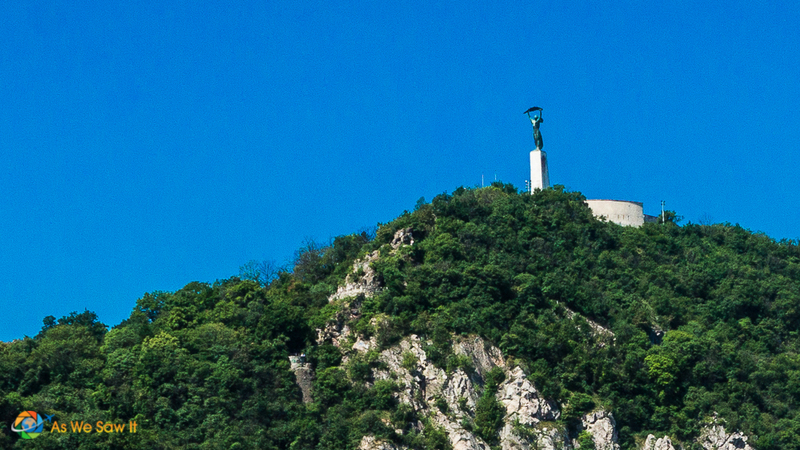 As we rode along the Danube banks to Elisabeth Bridge our guide pointed out a monument high atop the hill before us. 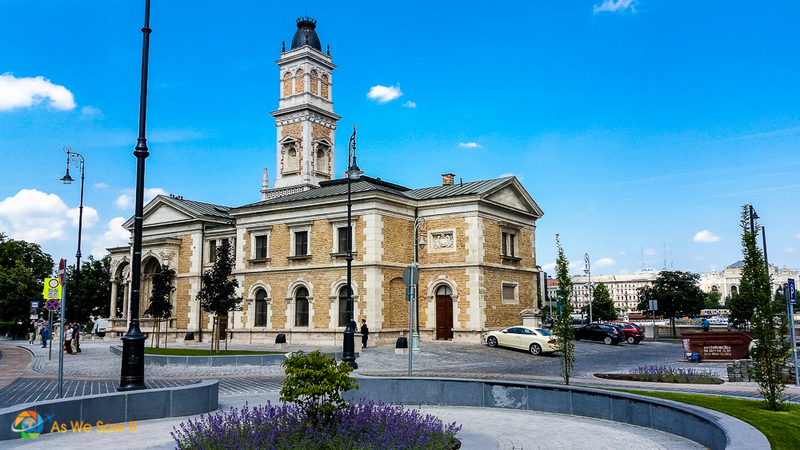 The statue of a woman holding a palm leaf was originally called the Liberation Monument in honor of the Soviet soldiers who “liberated” Budapest at the end of the Second World War. Now it’s called the Liberty Monument. It is one of a very few Soviet monuments that still remain in Budapest. Most of the Communist-era statues that survived the fall of Communism have been banished to Memento Park, a sculpture park outside the city. The light wasn't ideal for photography so we're sharing images from another day whenever possible. At our destination we braved the unseasonable chill and walked through Buda's ancient cobblestone streets. For such a compact area there's a lot to see. 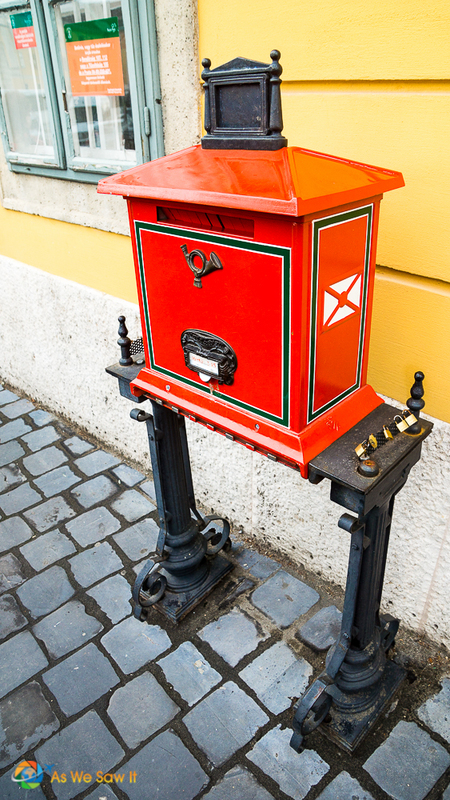 Our guide pointed out things we might have missed otherwise, such as a historic letter box that's still in use and souvenirs that we might like. Of course he also pointed out plenty of buildings as well. 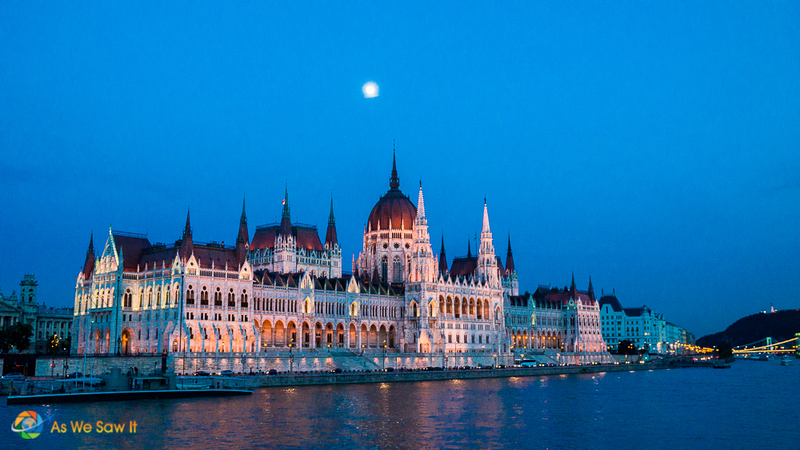 Some were famous, such as the Royal Palace, National Gallery and the National Széchenyi Library, and some were just plain historic. 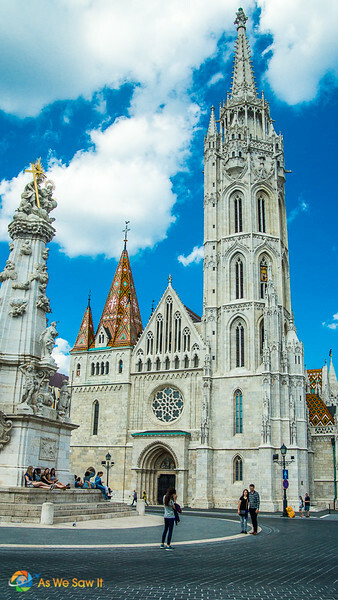 Matthias Church is one of the city’s best-known landmarks. It has stood for over 700 years and has witnessed many coronations and royal weddings. Our guide had to adjust the planned walking tour a bit because we couldn’t enter. Apparently they were honoring the Prime Minister’s birthday with a mass and tourists weren’t welcome. 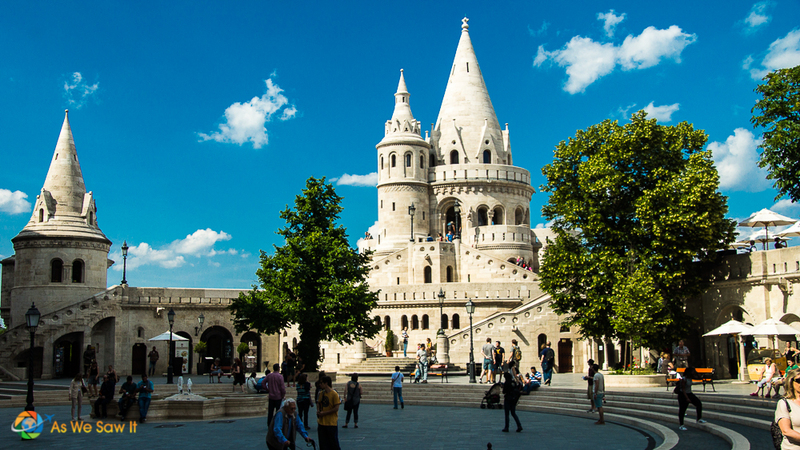 Our walking tour ended at Fishermen’s Bastion with a breathtaking panorama of the Danube. Our guide suggested everyone took off to explore on their own with a promise to meet back at the bus at 10:45. Thanks to the damp weather Dan and I went in search of a café. It's our favorite way to warm up. 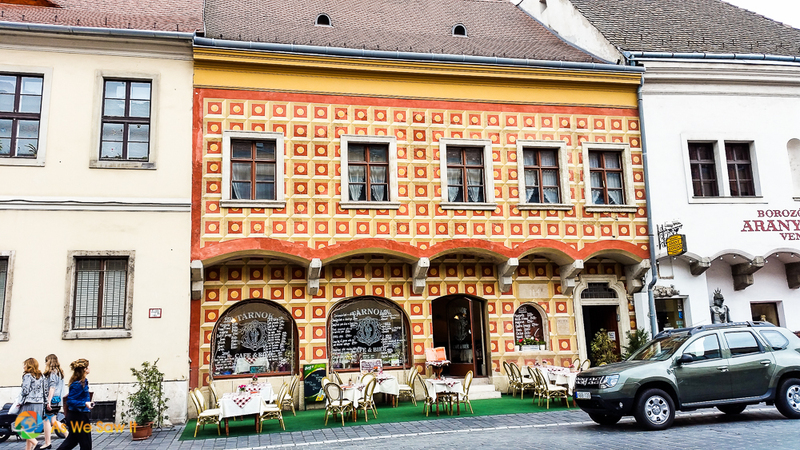 We soon found a charming coffeehouse that looked centuries-old, called Cafe Ruszwurm. 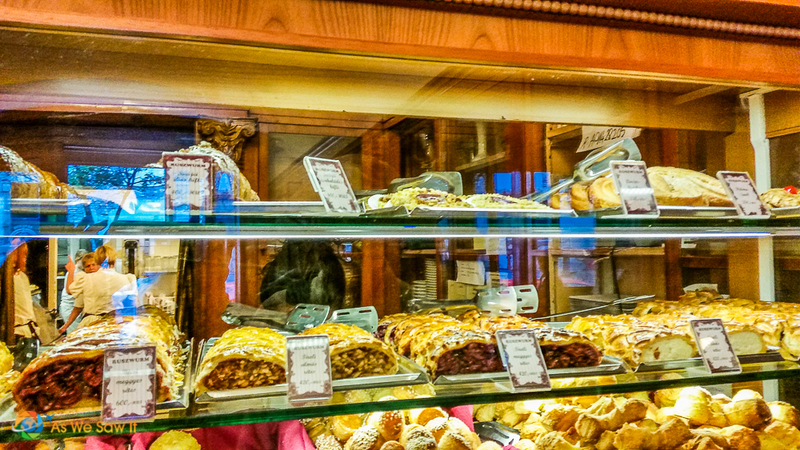 There was no way we could just get a mere cup of coffee when an ancient wood-and-glass cabinet, full of tempting pastries, greeted us inside the door. We finally ordered two espressos and a tasty sour cherry strudel to share from a pretty young waitress dressed in a traditional outfit. 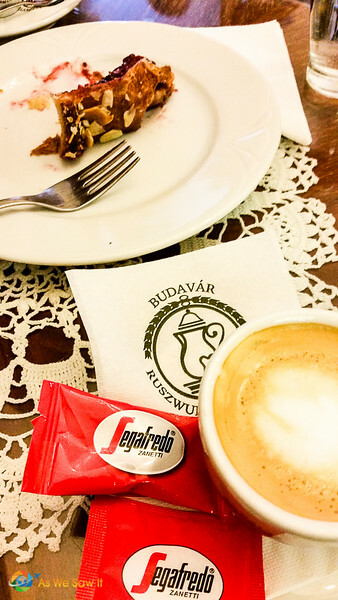 (I later learned that Cafe Ruszwurm is one of the oldest traditional cafes & confectioners in the city and that cherry-wood counter that we admired is 200 years old.) We savored the the cafe’s homey atmosphere until it was time to return to the bus. 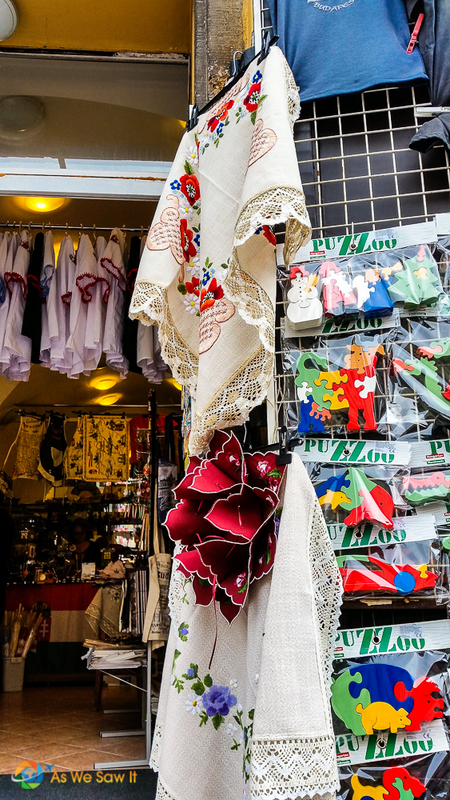 The second part of our tour, to Pest, was supposed to include a walk along Andrassy Avenue, Budapest’s high-end shopping street, passing the Hungarian State Opera House and culminating on the far end at Heroes’ Square. 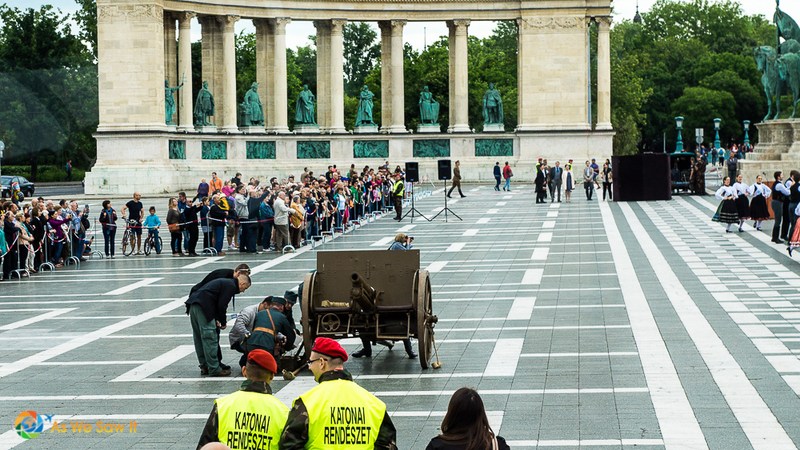 Unfortunately for us today was Heroes' Day and they were rerouting traffic and holding events on the square. So, no walking tour for us. Our guide and driver did their best though to make it up to us with an extended bus tour of the city. All good. Our guide was interesting, and we were able to see places most Viking passengers probably never have the opportunity to visit. When lunchtime rolls around you can choose between a light lunch on the Aquavit Terrace or full menu service as well as a salad bar in the dining room. 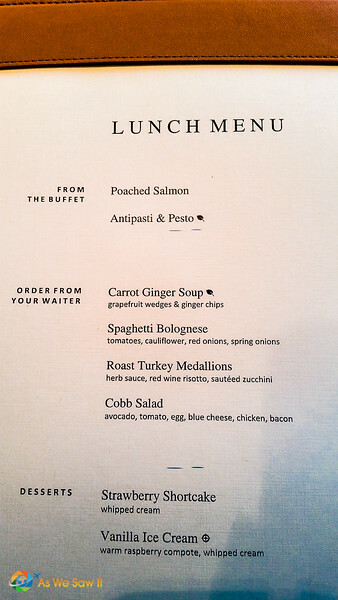 We ordered from the menu but the salad bar looked so good that we decided to have that tomorrow instead. Ria, the Maitre d’, is responsible for ensuring that all passengers on a special diet receive suitable dishes. 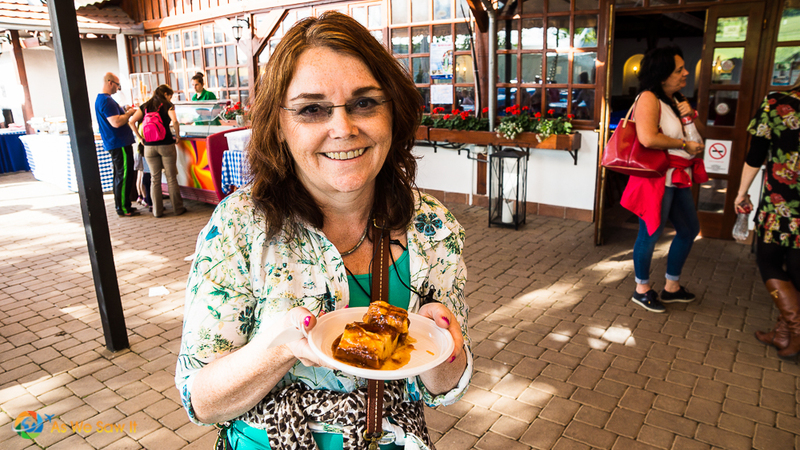 Every morning she brings us the day’s menu and we select our lunch and dinner items in plenty of time for the chef to prepare. Judging from the sheet she was carrying it looked like there are quite a few people with dietary limitations. 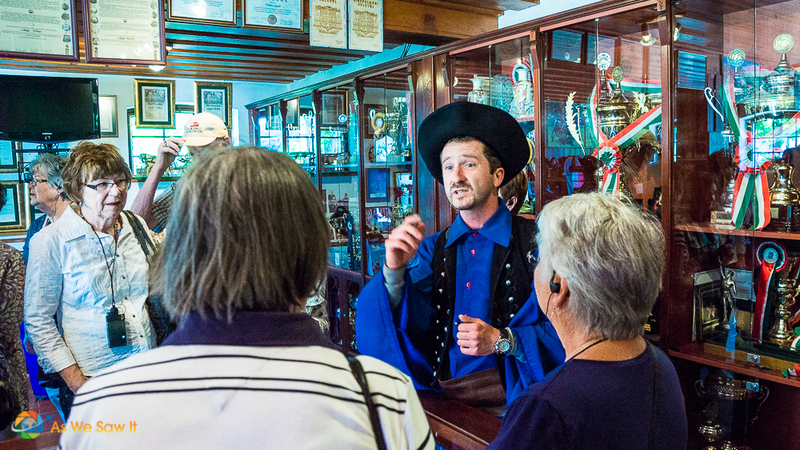 The afternoon schedule offered free time … or three optional tours. Thanks to arriving early we had already visited the Synagogue and a spa. We took the third tour. 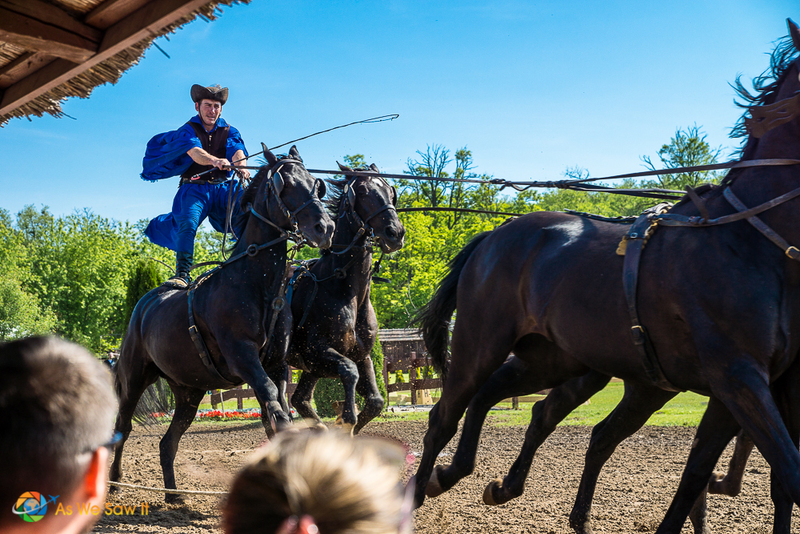 Our optional tour began with a 40-minute bus ride to Lazar Equestrian Park and a warning that It would be quite crowded because this weekend was a holiday, Children’s Day. Needless to say, there were kids everywhere. 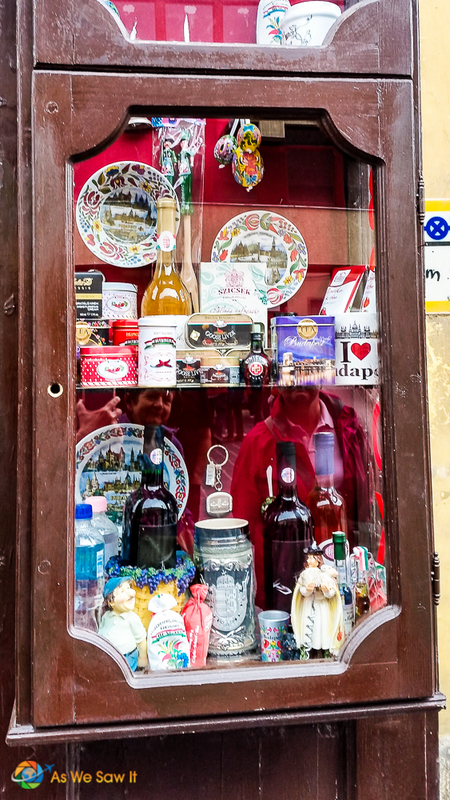 As we stepped off the bus we were welcomed us with a traditional biscuit and a glass of plum- or apple-flavored Hungarian brandy called palinka. We had a chance to see the stables and meet some of the Lipizzaner horses, then were escorted to the equestrian show, which was outstanding. It’s one thing when a kid stands up to get a better view, but it’s quite another when a horde of Chinese tourists do it. They felt it was perfectly acceptable to barge to the front of the audience, obliviously blocking everyone’s view while they took a shipload of photos. Thank goodness the host finally instructed everyone to sit down. We all agreed that offering Good Tourist lessons in China would be a great idea. After the show we took a horse-and-carriage ride around the property and saw a museum that displayed some of the numerous awards that their Lipizzaner horses had won. Before we returned to the bus Dan and I bought some ice cream and a sweet dessert that tasted like a thick custard and was topped with stewed plums. We arrived back at the ship a little after 6. Once back aboard everyone gathered in the Lounge so Captain Oliver Barsic and Hotel Manager Felix Anheier could welcome everyone aboard with a kir royale/mimosa/champagne toast. Then our Program Director Dewi gave the Daily Briefing, which is basically an overview of what to expect the following day. Once Viking Bragi had drifted down to Gellert Hill Captain Oliver kicked the engines into gear and headed the ship back upriver. Liberty Monument waved goodbye with her palm from the top as she watched us go. We are only 3 weeks from midsummer so it wasn’t fully dark – which was unfortunate – but it was still a memorable view. One by one, lights came on along the river and the sight became magical. 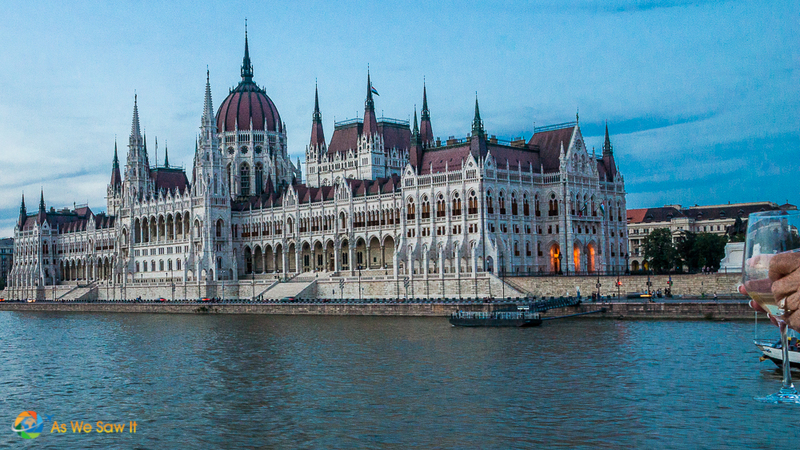 I overheard someone say “I can see why evening cruises are such a popular attraction in Budapest. The view is remarkable.” Lit up, the city was aglow. Hover over the top left of the image to save it to your Pinterest gallery. 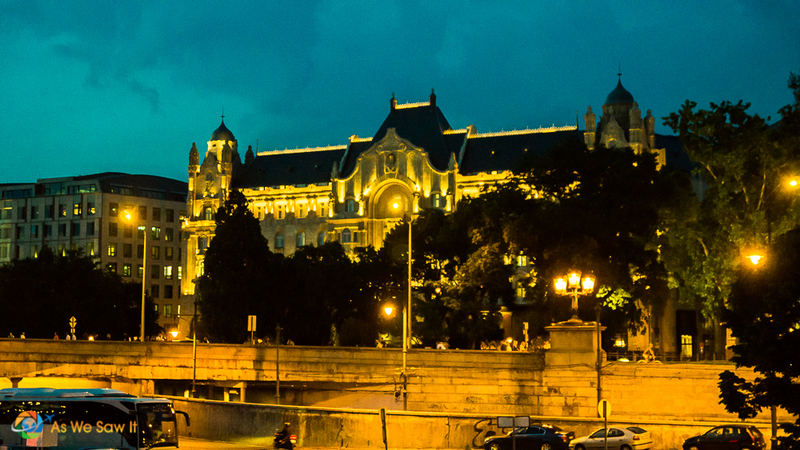 You'll also find more images in our Budapest photo gallery. 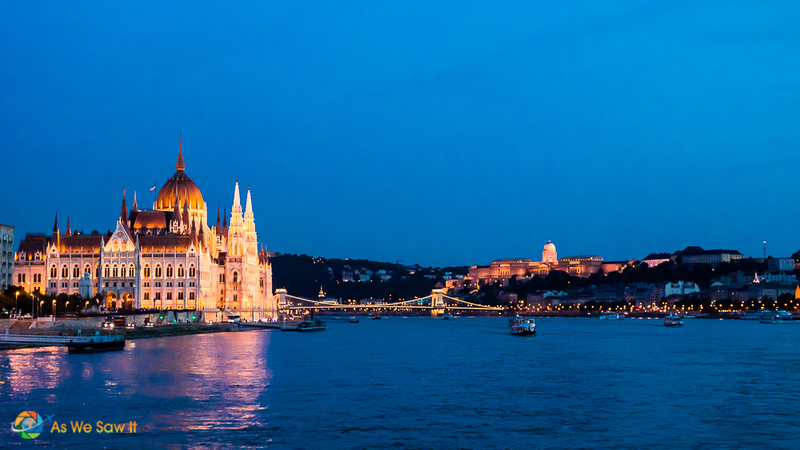 Have you ever been to Budapest? What did we miss?